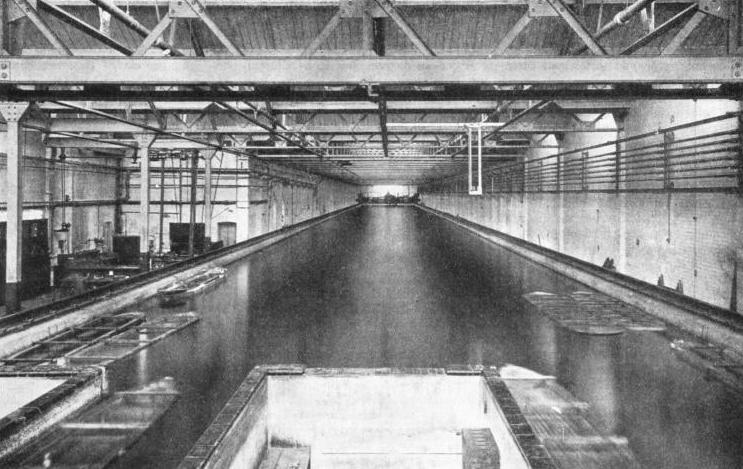 A MILLION AND A QUARTER GALLONS of water are contained in the Alfred Yarrow Testing Tank at Teddington, Middlesex. This tank is 550 feet long, 30 feet in breadth, some 12½ feet deep in the centre, and is laid out with the windows facing north, so that the wax models of ships shall not melt from the heat of the sun. It has saved the British shipping industry millions of pounds in recent years. AN important link with ships and the sea is not near the sea at all, but on the upper reaches of the Thames - nearly seventy miles from its mouth. This is the William Froude Laboratory at the National Physical Laboratory, Teddington, Middlesex. The William Froude Laboratory, a modern institution, comprises the Alfred Yarrow Tank, completed in 1911, the New Tank, completed in 1932, and the Lithgow Propeller Tunnel, a recent addition that enables such problems as the erosion of propeller blades to be investigated. “Tank” is something of a misnomer. The concrete basin is longer and deeper than, although not so wide as the average swimming-bath, and the delicate instruments that record the results of the tests are marvels of applied science. The hull, rudder and propellers are tested at various load-lines and speeds. For other tests a miniature sea is regulated by a wave-making machine, so that the designer of a freighter or a liner can tell how his vessel is likely to behave in all conditions. The laboratory has had an important effect on the design of ships and their propellers. More than £1,000,000 a year, it is estimated, have been saved by ship owners in fuel consumption alone. Considerable saving has also been effected in a reduction of repair bills and in the increase of the speed of vessels for a given power output. Experiments are also made with ships in service. Models are tested and any necessary improvements made on a wax model; those are subsequently transferred to the ship itself. For while a vessel may be fighting a gale thousands of miles away, a wax scale model of her hull may be battling with artificial waves in one of the Teddington tanks. Thus when the ship returns to port, she will be dry-docked and a new set of propellers may be fitted, or it may be found desirable to alter her hull. In recent years wax models of some of the ships that have been laid up because of trade depression have made momentous voyages in the Teddington tanks. Experiments have been carried out to discover what alterations can be made to enable a ship to put to sea again more economically. William Froude was a pioneer of propeller and hull research. He built a tank at Torquay, Devonshire, in 1870. The laboratory at Teddington is named in his honour. The Alfred Yarrow Tank is named after the late Sir Alfred Yarrow, who gave £20,000 towards its construction. The New Tank cost about £45,000. The Alfred Yarrow Tank is 550 feet long, and 30 feet in breadth; the depth in the centre is some 12½ feet. The windows face north because the models are of wax; if the sun were allowed to shine on the water for a considerable period and thus warm the water, some of the wax might melt and form a soapy film on the surface; this would retard the hull and upset the calculations. The Alfred Yarrow Tank contains about one and a quarter million gallons of water, and took about three weeks to fill. 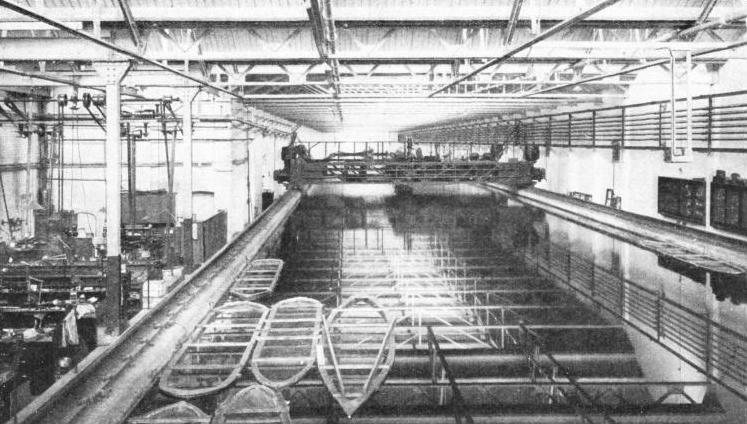 Spanning the waterway is a carriage from which the models are towed the entire length of the tank. This is propelled by four electric motors, each of 40 horse-power. At the south end of the tank is the wave-making machine. This consists of a flap which is moved by an electric motor and so agitates the water, the roughness of the waves depending upon the speed of the flap. As the model travels through the water from the north end of the tank it is making headway against a head-sea. which has the most adverse effect upon a ship. The New Tank is laid out from east to west, and the windows are arranged on the north side so that the sun will not affect the temperature of the water. This tank is 678 feet long and 20 feet wide. The depth of water is 9 feet at the eastern end for a distance of 446 feet; the bottom then rises at a uniform gradient for a distance of 36 feet to the shallow western end, where the depth is 2 feet for the remaining length of the tank. This shallowing of the New Tank enables the effects of shallow water on resistance and steering to be studied. The carriage is propelled by two electric motors, each of 40 horse-power, and weighs 4½ tons, compared with the 15-tons carriage of the wider tank. A certain distance has to be allowed for the acceleration of the carriage when a model is tested. This distance is 150 feet in the Yarrow Tank, with a trial path of 200 feet; the trial path in the New Tank is 380 feet. By means of a false bottom the depth of water in the Yarrow Tank can be adjusted to any measurement less than the normal 12½ feet in the middle. The speed of the travelling carriages ranges from 25 feet a second to 20 feet a minute. The model of any vessel to be tested is made in the Laboratory. The shipbuilder first supplies drawings. These consist of a table of measurements known as offsets at a number of regularly spaced transverse sections and water lines, or horizontal sections comprising a lineal history of the hull or body plan on any convenient scale, with a contour of the stem and stern. The models vary in length from 6 to 20 feet. The shipwrights make templates for both the inner and the outer shape of the model. The former is covered with canvas, and a wax casting is made in a clay mould. The width between the canvas-covered templates and the sides and bottom of the casting is 2½-in. The wax, which is to form the hull, is heated to a temperature of 140 degrees F. and then poured into the casting between the canvas-covered core and the clay. The wax consists of 95 per cent paraffin wax and 5 per cent beeswax and stearine for hardening. The inner hull is filled with water and kept down on the wax by iron ballast; any air bubbles are worked out of the wax by probing the stem so that they leave at the tail end. When the wax has cooled, the hull is taken out of the mould to the shaping machine, in which it is placed upside down. Scale drawings of the lines of the hull are laid horizontally upon a drawing table containing pantograph gear (i.e. an instrument, for copying plans on any scale), which enables the operator to follow the lines on the drawings and so cause two milling knives which are fixed on either side of the hull to reproduce the lines on the moulded hull; the surplus wax is pared away until the hull is exact to the drawings. Then the model is placed in a dock at one end of the tank, and begins a series of tests. During the twenty-five years that the tests have been made so much information has been obtained that sometimes a design can be altered before the wax model is made, the drawings revealing faults in design that have been proved by previous tests. Out of sixty designs tested in 1934 no fewer than thirteen were improved before being tested. The tests are exhaustive, as a series of tests is carried out for each modification of the hull. If the designer wishes to have a hull tested for resistance over a range of speeds so that the horse-power required to drive the ship can be calculated, the making of the model and the tests can be completed within a week. In this event the. model will not be self-propelled, but will be towed by the carriage. This travelling carriage runs on rails laid on either side of the concrete tank, and contains instruments for recording water resistance to the hull, and other data. The wax model is ballasted to the correct water-line, and the carriage on which the experimenters travel begins the journey, by applying the towing force to the model in such a manner that it is free to rise and fall and take up its natural running trim. Natural conditions are thus reproduced in the tank as far as practicable. The time, distance, and resistance of the hull recorded on the instruments are corrected for scale and friction and calculated in terms of the horse-power required for the full-sized ship. FOR RESEARCH ON PROPELLER PROBLEMS - the Lithgow Tunnel for testing propellers at Teddington. The Lithgow Tunnel comprises a large vertical hoop 16 feet in diameter, the average diameter of the water channel being 3 feet. Water is circulated by a pump, and the propeller is placed in a chamber in the upper arm of the tunnel; the effects are recorded on an apparatus. A self-propelled model carries automatic recording gear for the propeller or propellers and electric driving gear. An electric motor drives the propeller shaft, and the revolutions, torque and thrust, are recorded by instruments carried in the model, the speed being controlled by the operator on the carriage, which travels at the same pace as the model. After each test there is an interval of ten minutes to allow the water in the tank to become still. There is no loss from evaporation, and the bulk of the water in the Yarrow Tank is the same as that put into it nearly twenty-five years ago. The wastage from other causes is practically negligible. Further, the water is not allowed to become stagnant because of the nature of the tests. Research work in the tanks is divided into six sections: (1) Resistance, trim, and wave profile of any ship-shaped forms. (2) The propulsive coefficient of single, twin, triple, or quadruple screw ships. (3) Comparative steering value of various designs of rudders, and the forces acting on them in certain circumstances. (4) Resistance and other features of hydroplanes and flying boats. (5) The streamline now round a ship hull, and the correct positioning of propeller bossings. (6) The effect of rough water upon hull resistance and propeller efficiency. Models for testing rudder designs carry recording apparatus at the stern. Propeller models are made from the designers’ plans and are tested with the hull. 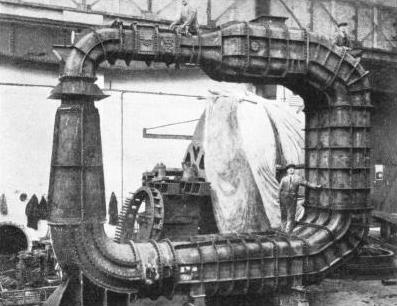 The Lithgow Propeller Tunnel comprises a large vertical hoop 16 feet in diameter, the average diameter of the water channel being 3 feet. Water is circulated by a pump, and the propeller is placed in a chamber in the upper arm of the tunnel; the effects are recorded on an apparatus. The cost of the Lithgow Propeller Tunnel was defrayed by the well-known Clydeside shipbuilder Sir James Lithgow, who gave £5,000 for research on propeller problems. The damage caused by erosion is very marked in fast vessels, such as liners and destroyers, the propellers of which deal with great forces, so that the blades soon begin to crumble. Windows in the Lithgow Tunnel enable the effects to be seen and photographed. Members of the staff have made many voyages to collect first-hand information about storms, the height of waves, wind pressure and the behaviour of ships in all sea conditions; they can thus compare the conclusions derived from laboratory research with what happens at sea. Not only large ships are tested but also small craft. The results of the tests have been remarkably successful, and ship owners have been saved large sums of money, in addition to obtaining more efficiency out of their vessels. One of the most spectacular and successful tests concerned some barges owned by a London company. 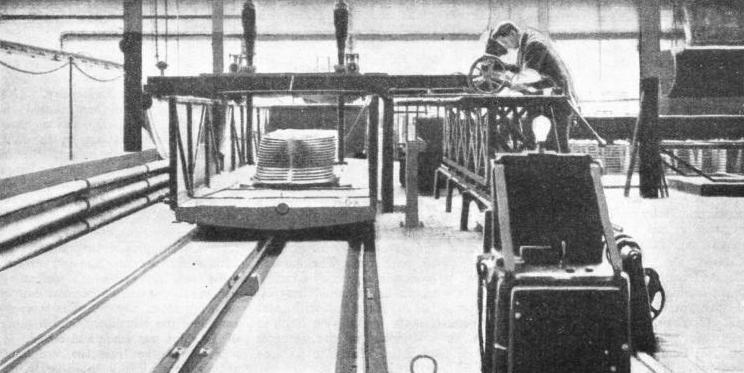 After the laboratory staff had altered the models the new barges were towed over a measured distance by the same tug which towed older barges. Results in practice showed that the new barges towed 33⅓ per cent faster than the old type, while the power output of the tug was slightly less. SPANNING THE WATERWAY of the Alfred Yarrow Tank is a movable carriage for towing models. This carriage is propelled by four electric motors, each of 40 h.p. At the south end of the tank a wave-making machine agitates the water so that as the model travels from the north end it moves against a head-sea, which has the most adverse effect on a ship. In the foreground are wax models awaiting test. Another outstanding success concerned a shipping company that was building five vessels. The first two were completed, but proved to be bad sea boats as they sustained extensive damage on every rough voyage. The company consulted the laboratory, and a model of the ships was made and tested. As a result of the tests the two faulty vessels were altered immediately, and the other three were made to a new design. As the first two vessels had incurred repair bills amounting to £10,000 a year each, some idea of the value of the Froude Tanks can be gathered. One great problem in hull design is to eliminate eddies which decrease the efficiency of the propeller. The laboratory has performed an important part in the development of the cruiser stern for cargo vessels by showing that this type of stern helps to avoid eddies. Introduction of what are called “Aerofoil” propellers is also largely due to the laboratory. In an ordinary propeller the back of the blade is the arc of a circle with the thickness at the mid point of the blade, whereas in an “Aerofoil” propeller the maximum thickness of the blade is slightly nearer the edge. The first “Aerofoil” propeller fitted to a cargo ship increased her speed of eight knots by a quarter of a knot, and a pair of propellers fitted to a liner added more than half a knot to her speed; in each instance the fuel consumption was not increased. An important saving in fuel for single-screw ships was effected because of the laboratory’s experiments with a thin plate or fin placed behind the propeller in a single-screw ship. The fin affected the flow of water through the propeller and also to and from the rudder, so that a ship was able to get as much as an additional half a knot and was also quicker on the helm. There are, incidentally, many patented devices of this type on the market. Apart from the saving of fuel, the tanks enable experiments to be made with new ship-forms to an extent that would be impossible by a different method. The only other method would be to build the ships. This would check enterprise, as no designer could risk the tremendous cost that would result from failure of the full-sized ship in service. Forty-nine of the sixty designs tested in 1934 - the latest year for which statistics are available - were materially improved. Of these forty-nine thirteen were improved before test; after test twenty-one were improved from three to ten per cent, twelve from ten to twenty per cent, and three from twenty to thirty per cent. This system of testing models showed such results that in recent years the William Froude Laboratory has been so pressed with requests for tests that the Yarrow Tank was inadequate and the New Tank was put in hand. The New Tank was opened by Mr. Stanley Baldwin in November, 1932, and the number of models tested in that year was only twenty-eight. This figure increased to forty-five in 1933 and to sixty in 1934. The work is so important that the Government provided the cost of the New Tank. Research work of a genera] character is undertaken for the whole of the shipping of the country and the results are communicated through the technical societies, but when one firm orders tests the results are confidential. The laboratory is not a profit-making concern and charges only the cost of the tests. The average cost of testing a new design is about £300. Often the charge is considerably less. One form of hull can be tested through a complete range of speeds for £140, and the charge for additional draughts or other modifications varies between £12 and £40, so that three forms can be tested for about £210. Model propellers are tested behind the hull models for an additional fee of £40 and upwards. The types of models tested are varied and include destroyers, fast liners of above seventeen knots speed, slower liners, ocean cargo ships above and below eleven knots, cross-Channel steamers, coastal craft, including paddle ships, ferry steamers, shallow draught vessels, yachts, tugs, barges and even dredgers. Certain of the larger shipbuilding firms have private tanks. At Dumbarton on the Clyde is the testing tank of Moss Downie Bros., where the hulls of many first-class passenger ships have been tested. Farther up the river, John Brown’s yard, at Clydebank, has another tank in which the hulls of most of the modern Cunard liners have been tried out. There are establishments of a similar nature in Europe. There is a tank at Hamburg in Germany, but one of the best known on the Continent is situated as far away from the sea as Vienna, in Austria. In the United States of America most of the warships and merchant vessels are tested at Washington. The British Admiralty also has a tank of its own. This is at Haslar, near Portsmouth. WHEN THE WAX MODEL of a hull has cooled it is taken out of the mould to the shaping machine. Here the model is shaped by an operator who has the scale drawings in front of him and, by mechanical means, can ensure accuracy. You can read more “Building a Liner”, “Propelling the Modern Ship” and “The World’s Largest Ships” on on this website.